Thank you for your continued faithful prayers and gifts of support the last few months. Many of you have been praying about the “land” problem that arose a few weeks ago. We are still waiting on the Lord for answers. The problem arose when the city police decided they needed another station at this end of the town of San Antonio. They asked the Iglesia Evangelica Maranata down below us if they could use their Sunday school building to house eight men and three women police while they build a new station. They would want to use the property for at least a year. The question of the playing fields came up and it was even mentioned that perhaps these could be used for the public. From the last word we received, the police are considering two other locations for temporary quarters. We trust the Lord to guide and direct in wisdom through this unexpected turn of events. Cofan village visits – Ron was able to make two visits since the last newsletter and has been able to encourage Sinangue, Dovuno and Dureno. He is taking off on another trip with two friends from the States this Friday August 1st – 5th. Pray – there has been no progress toward helping Ramon get eye surgery for the pterygium. The Dureno Church’s next outreach is planned for August 4th – 14th and will be to the Cofan village of Zabalo and Siona/Sequoya village of San Pablo. They will be evangelizing in these and other small villages and showing the Cofan language “Jesus” movie in the Zabalo area during this trip. 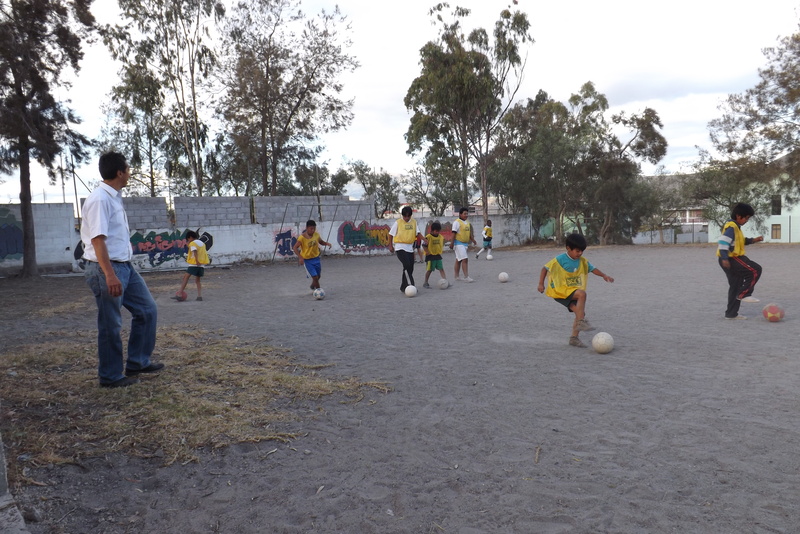 Vencedores (Sports Club) – continues to meet on Mondays with a good attendance of neighborhood kids. Cofan IBME students: It has been summer break for the Instituto Biblico Missionero Ecuatoriano students. This Bible school is connected with the ministry of Lloyd and Linda Rogers here in Ecuador and is geared to training people from tribal groups. 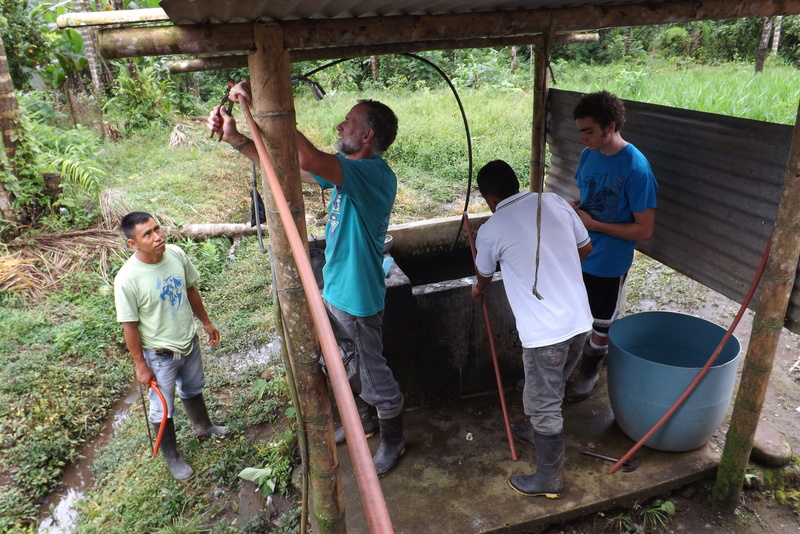 Marcelo (will begin his 3rd year of studies) from the village of Sinangue has been able to spend time with his family and help Ramon and Bautisto with the Sinangue church and go with Ron on some of his other village trips during summer break. There have been several inquiries from some of the other Cofan villages about sending some of their young people to the Bible school. The cost of each student is about $105 a month, and many of these young people come from families poor in worldly wealth. If you are interested in sponsoring a Cofan Bible school student, please let us know! Classes will start up again in early September. Other Ministry Opportunities: Ron has continued with three Bible studies over the summer months. On Tuesday night he teaches one in Cofan to Aurelio and his family. Thursday morning he helps with one in English and Thursday night he helps with one in Spanish. The next few weeks he will be filling in for the College-Career Bible study that meets on Thursday evenings in Quito. Esther met earlier this week with her women’s group who plan to start up their English Bible study again in September in the book of Ruth. We are hoping more young mothers can attend by offering childcare. Possible intern: We have a young man, Tyler Marsh, who is interested in coming down for 6 months to be a missionary intern. His specialty is soccer/futbol and he would assist with the Vencedores club, teaching the Cofan kids during jungle visits and a few other opportunities we are checking into. Pray with us as he raises the support he will need for his time here and works on the paperwork needed to come. If everything goes well and Lord willing, he plans to come down in November. Homeschooling Activities: We will be starting up our Homeschool Teen Fellowship meetings on August 22nd and hopefully have a Homeschool Mom’s (support) Meeting late August early September. Family: This summer has been somewhat quieter than others in the past, but we haven’t minded! Esther will start with homeschooling next Monday August 4th for Isaac in 11th grade and Aaron and Andy Rogers in 9th grade. We are thankful for the privilege of homeschooling our kids and those of our friends! Julia and Sarah have enjoyed their job in Minot, ND this summer. They work at one of the DQ’s in town that hires a lot of internationals. They have made friendships with people from Spain, Macedonia and Serbia. They head down to Emmaus Bible College on August 20th for Julia to attend new student orientation and both start classes on the 25th. We are so thankful for the kindness of the Scott family who opened their home to the girls this summer to live and gave them the use of a car for work. Ethan has been staying with the Ridgeway family in Eastern Washington and helping with the wheat harvest the last few weeks. He is looking for employment after that and guidance and direction for some important life choices. We are so thankful for the hospitality of old and new friends – the Ridgeways and the Scotts! Lydia continues to work as a secretary in a branch Compassion office here near our house and will be starting up English lessons again with some students. Many blessings and prayers. I’ve not said it often enough, but from afar I’ve prayed for you these many years.